Kandy SC centre Danushka Ranjan (with ball in hand) on his way to score one of his two tries. Rugby legend Fazil Marija hung up his boots yesterday ending a 15-year legendary playing career as Kandy SC scored a superb 21points (3 tries, 2 penalties) to 7 (1 try, 1 conversion) win over Navy Sports Club in their Dialog ‘A’ Division Clifford Cup knock out Rugby tournament finals played at CR & FC grounds in Longden Place, thus winning the Clifford Cup. Kandy were leading 8-nil at the breather. 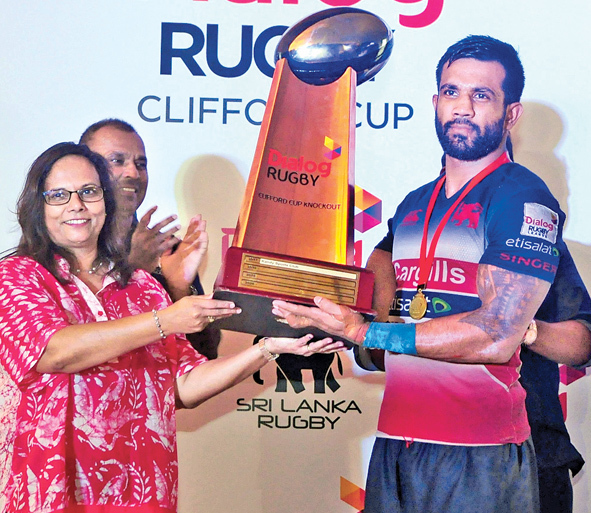 Kandy SC skipper, Gayan Weerarathne, receiving the Dialog Rugby Clifford Cup champions trophy from Amali Nanayakkara - Group Chief Marketing Officer, Dialog Axiata PLC. It was Kandy’s three quarters who paved the way for this victory. Especially Fazil Marija gave a terrific display to outplay their famed counterparts. Navy were let down by their three quarters who delayed their passes which saw them being ‘nailed’ over and over by their opposite numbers and also ‘knocked on’ at crucial moments which resulted in their speedy wingers Chathura Gomez and Buddima Piyaratne being kept in cold storage. But on the few occasions they got possession both made some threatening runs before they were brought down in the nick of time by the vigilant Kandy defence. The Kandy outfit went in to a 5 nil lead in the 3rd minute of play when centre Danushka Ranjan touched down for a try which full back Nigel Ratwatte fluffed the conversion. In the 33rd minute Kandy increased their lead to 8-nil when Ratwatte slotted in a simple penalty. They went into the half time leading 8-nil. 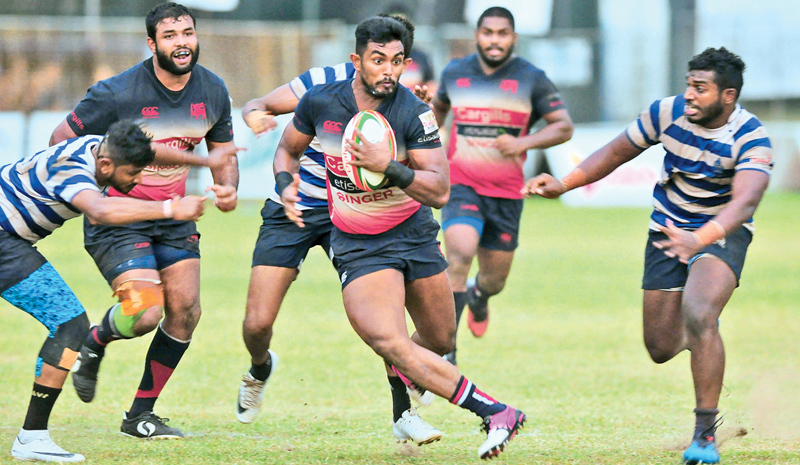 After the breather Navy SC cut down the lead in the 42nd minute when fly half Mohamed Abzal ripped off the ball from Marija and scored under the post after a 40 metre dash. Full back Thilina Weerasinghe put over the conversion to reduce the gap 8-7 in favour of Kandy. In the 59th minute Kandy SC surged into a 13-7 lead when Ranjan scored his second try of the match. Full back Thilina Wijesinghe missed the conversion. Soon after Kandy scored again in the 62nd minute of play when Wijesinghe fired across a 30 metre penalty to increase the score to 16-7. Kandy SC sealed the game in the 65th minute when flanker Shehan ‘Lema’ Pathirana scored a try off a spectacular cross kick by Marija. Wijesinghe missed the conversion but Kandy Sports Club ran out worthy winners, beating Navy by 21 points to 7.